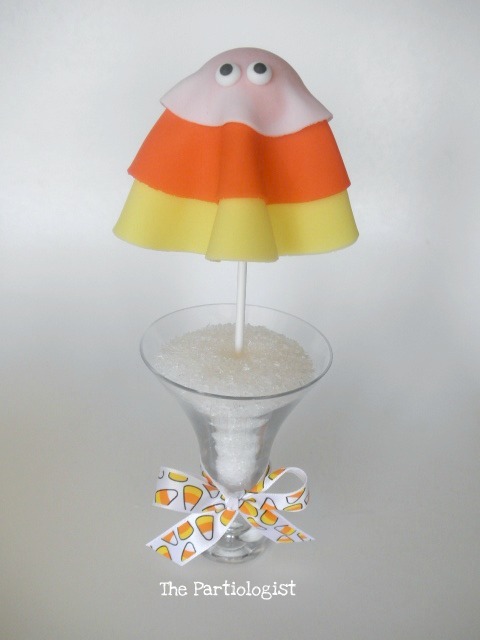 The Partiologist: Candy Corn Ghost Pop! It's getting close to the end of my Candy Corn posts and I didn't want to forget this one - My little Candy Corn Ghost Pop. I started by rolling out three colors of fondant. Yellow - which I cut in the largest circle. Orange - Cut a little smaller circle. And white - the tiniest of them all. (As you can see, I forgot to take photos after I cut them into circles). After cutting and laying them on top of each other, I made some chocolate cake balls. I just realized that a little dum dum sucker would be just the right size too. Inserted a white sucker stick and covered with the fondant and added little eyes. Isn't he/she sweet?